This shirt is from Threadless. Cori once said to Skotte, “I love you more than music!” This was a big statement for her, because her life revolved around music. Skotte replied to Cori, “I love you more than bread!” Most people know about Skotte’s love of bread, so this was really saying something! This shirt just screamed out to belong to Skotte. The cool thing about it is the back is the reverse of the front. 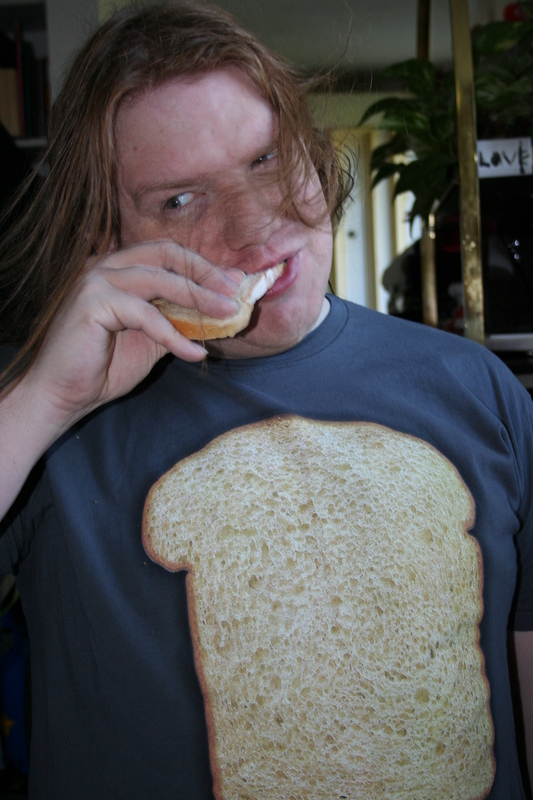 This shirt literally makes YOU the delicious filling of the shirt sandwich. It also reminds Cori of a funny joke. The vendor pocketed the money, and handed the Buddhist monk his hot dog. The monk, after waiting for a moment, asked for his change. The vendor looked at him and said, “Change comes from within.” With a wistful smile, the monk walked away.